As college tuition and student debt soar, schools across the country are pumping billions of dollars annually into so-called “sustainability” initiatives, which include using expensive renewable energy sources to reduce their greenhouse gas emissions. But what does sustainability really mean? And does it make sense for colleges to divert so much money and resources to nebulous environmental causes at the expense of scholarships, financial aid, or educational programs? A new report from the nonprofit National Association of Scholars (NAS) explains the numerous ways campus sustainability harms higher education. The report estimates that American colleges and universities spend more than $3.4 billion per year on sustainability-related programs. In exchange, the report finds that “the sustainability movement distorts college curricula” and has “shut down reasoned debate on campuses by foreclosing open inquiry” on environmental issues. In reality, students and parents are bearing the high cost of sustainability. As the NAS report shows, colleges are pouring vast sums of money into renewable energy programs that drive up costs, inflate tuition, and have little real impact on the environment. Moreover, the sustainability movement has contributed to the rise of a new movement: one that pressures universities to “divest” their financial holdings in natural gas, oil, and coal companies. The problem is that these universities would divest not only from these fuels, but from the products made from natural gas, oil, and coal, including life-saving pharmaceuticals, high-tech fabrics, steel, and computers, to name a few. Instead of divesting from the energy and products of modern life, we should divest from the unsustainable cost of sustainability. According to the U.S. Environmental Protection Agency, “sustainability creates and maintains the conditions under which humans and nature can exist in productive harmony, that permit fulfilling the social, economic and other requirements of present and future generations.” As EPA explains, “Sustainability is important to making sure that we have and will continue to have, the water, materials, and resources to protect human health and our environment.” That sounds like a worthwhile cause—nobody is against protecting the environment and public health. In practice, however, sustainability has devolved into an enormous waste of time and resources. One example of this can be found on college campuses. The National Association of Scholars (NAS) released a new report examining the negative effects of campus sustainability programs. The thrust of the report is that colleges are diverting vast resources to sustainability programs even as tuition rates rise, student loan debt soars, and the unemployment rate among college graduates climbs. First, consider that NAS estimates American colleges and universities spend more than $3.4 billion each year on sustainability programs. That’s enough money to cover tuition for more than 108,866 students to attend private university, or provide in-state tuition for more than 372,031 students. Yet instead of expanding educational access, hundreds of colleges are spending that money promoting expensive renewable energy schemes. This problem is exacerbated by the fact that the cost of attending college has exploded in recent years. The latest data show tuition and fees at private nonprofit colleges rose 3.7 percent last year, or twice the rate of inflation, to $31,231 per year. Meanwhile, student loan debt is rising to cover higher tuition costs: average debt per student with loans has nearly tripled from $9,450 in 1993 to $29,400 in 2012. Over that time, the percentage of seniors who graduated with loans rose from 47 percent to 71 percent, according to recent data. And finally, 7.5 percent of recent college graduates are unemployed, compared to the national unemployment rate of 5.5 percent. The NAS report examined Middlebury College as a case study in the high cost of sustainability. In 2006, Middlebury pledged to go “carbon neutral” by 2016. To achieve that goal, NAS estimates the college spends almost $5 million per year, or more than $2,000 per student. 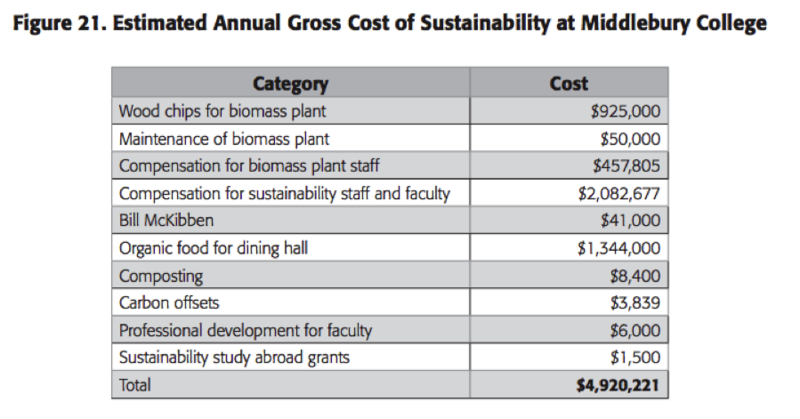 The following chart details Middlebury’s annual spending on sustainability programs. More than 42 percent of the total, or about $2.1 million, is spent not on sustainability itself, but on salaries and benefits for the bureaucrats hired to carry out the school’s sustainability efforts. These annual costs are only part of the story. NAS estimates that Middlebury spent an additional $13.9 million in fixed, one-time costs, including construction of the campus biomass plant. And while Middlebury claims its wood-fed biomass plant saves the college $840,000 per year in fuel oil and $323,709 in operation costs, net costs for Middlebury’s sustainability programs still eclipse $3.7 million annually. It also means it would take the college more than 15 years to pay off its $13.9 million fixed costs, assuming a 5 percent interest rate. With such a high price tag, students and parents should expect a reasonable return on their investment. Unfortunately, Middlebury’s efforts to combat climate change amount to a drop in the proverbial bucket. Since 2007, the college has reduced carbon dioxide emissions by 27,618 metric tons, or the amount of carbon dioxide 0.007 of an average coal-fired power plant emits in a single year, according to EPA’s greenhouse gas calculator. That means Middlebury spent $543 per metric ton of carbon dioxide reduced, according to NAS. For context, the Obama administration’s official estimate for the value of reducing carbon dioxide is about $39 per metric ton. As we have explained numerous times, the so-called “social cost of carbon” is a dubious metric that likely inflates the value of CO2 reduction. 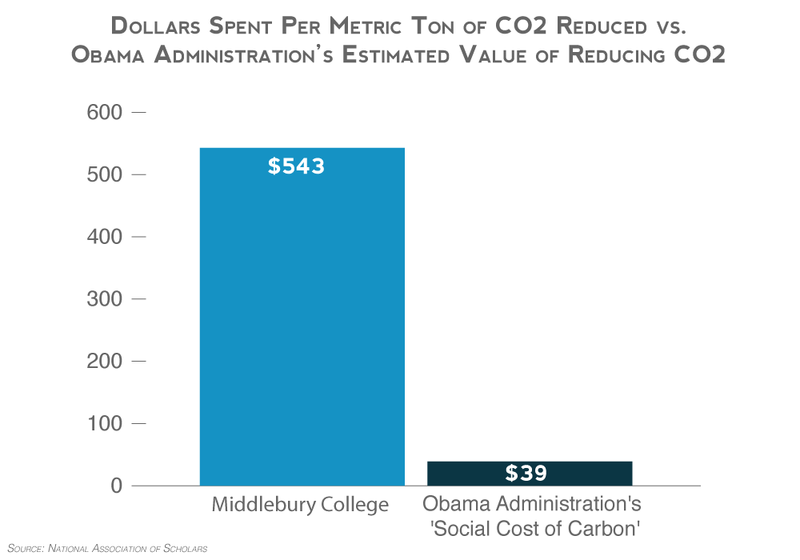 That means Middlebury paid almost 14 times more than even what the Obama administration claims is the true value of reducing carbon dioxide. In exchange, the college reduced emissions equivalent to less than one hundredth of a single, average coal plant. This scheme is the opposite of sustainable. It is an enormous waste of money, the costs of which are borne by students and parents. Perhaps more importantly, it is also a waste of time, which is a nonrenewable resource. Every moment dedicated to researching and implementing Middlebury’s “carbon neutral” pledge is time not spent doing what colleges are supposed to do: educate students. Over the last few years, fossil fuel divestment campaigns have cropped up on college campuses across the country. These activists pressure universities to “divest” their financial holdings in natural gas, oil, and coal companies. Though largely unsuccessful, divestment activists have convinced some schools, mostly small liberal arts colleges, to sell off their energy assets. [Divestment] embodies the ethos that sustainability embraces. The underlying idea is that fossil fuels desecrate the environment, that this desecration is sinful, and that those who would persevere in their reprehensible ways deserve condemnation. The campaign to divest from fossil fuels manifests the fervor of a religious quest for purity and absolution. It declares the public guilty of oil on their hands. As we explain on our Divestment Truth page, fossil fuel divestment is morally bankrupt for a variety of reasons: taken to its logical conclusion, it would consign billions of people around the world to poverty and darkness; eliminate more than 82 percent of the energy Americans use; deny access to the lifesaving products made from fossil fuels; and make it more difficult for low-income students to attend college. Sustainability and divestment activists have succeeded in passing the costs of their activism on to parents and students, many of whom may not support their radical causes but nonetheless bankroll these efforts in the form of higher tuition and crippling loans. Natural gas, oil, and coal make modern life possible: they comprise the vast majority of our energy are key feedstock for many every day products, including pharmaceuticals and medical devices. True sustainability is embracing the notion that energy makes life better. If we should divest from anything, let’s start with the unsustainable costs of campus sustainability.